It's become a tradition here at The Escapist to do a "Five Favorites" roundup at the end of the year, where each of the staff members posts their own list of the five games they enjoyed the most over the past twelve months. It's a fun little tradition, but we realize that it can tend to get skewed towards games released in the last part of the year - not only is that the blockbuster season, but they're fresher in our minds. Since summer is traditionally considered a low-key time in gaming with few major releases, we thought it'd be a good idea to use the downtime to give the first half of the year its due. Over the next week, The Escapist's editorial staff will be sharing three of their favorite games from the first six months of 2010 - along with one "extra" from whenever - that you might want to pick up during these summer doldrums. Are these what we think are the three best games of 2010 so far? Nope. Are they our three favorites, full stop? Nah. We just enjoyed them, and we think you might, too. I've made no secret of my love for the PokÃ©mon franchise - a love that has lasted over the years from my very first run through PokÃ©mon Blue to my capture of all the latest legendaries in PokÃ©mon Pearl - so it's not surprising that this game would be on the list. What is surprising, however, is just how good HeartGold and SoulSilver actually are. They bring the refined and strategic mechanics of the series' fourth generation and combine them with the huge world of the second-generation titles Gold and Silver. Essentially, it's the best PokÃ©mon gameplay with the best PokÃ©mon world and all of the classic 'mons. In other words, HeartGold and SoulSilver are the best PokÃ©mon games yet. Seriously. I've spent hundreds of hours trying to catch 'em all and train up an elite fighting force - or rather, I would have been doing that if I hadn't been spending all of my time in the Battle Frontier trying to win those damned 2v2 matches at the Battle Factory. If you've ever loved a PokÃ©mon game from Red and Blue onward, you owe it to yourself to pick up one of these games. The beginning of Final Fantasy XIII will represent a significant barrier for many gamers - there may be no better game that embodies the "slow start" better than this one. The characters seem unlikable, the story is confusing, and the battle system refuses to stop holding your hand ... but then it does. 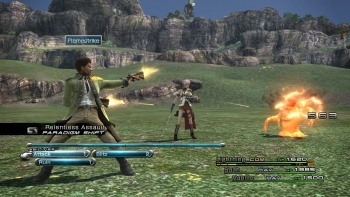 Once Final Fantasy XIII opens up and takes the training wheels off, it becomes a great experience. The characters become likable, the story comes together, and the fast-paced, tactical battle system congeals into one of the series' best. FFXIII is a game that's stayed with me long after I beat it and expected to just forget about it on the pile of "other solid games I've played recently." If you can get through the slow start, you'll find an experience on par with the best games in the series like VI and X - just be prepared to be in it for the long run. I'll admit it - I'm a sucker for awesome movement mechanics in videogames. If you give me a way to get around that 1.) looks cool, 2.) feels great, and 3.) works smoothly, I'll probably like your game waaaaay more than I would have otherwise. Transformers: War for Cybertron does exactly that - and given that the entire game is about robots who turn into vehicles, it damn well better have. The transformation mechanic at the core of War for Cybertron is intuitive, works at the touch of a button (literally), and lets you zoom all over the place and blow stuff up before turning back into your robot form and ... blowing stuff up. What can I say? It's a simple pleasure. It also helps that the rest of the game is pretty damn fun, too, blending an energetic and frantic multiplayer with a solid singleplayer campaign that fans of the Transformers will find is very faithful to the franchise. If you wrote off War for Cybertron as a crappy licensed game, be prepared to find that it's more than meets the eye. This is my "gimme" - the one game on the list that isn't from this year. Torchlight, which was released last fall, actually made my Five Favorites list last year - but there's no reason not to promote an awesome game again. Torchlight is a game that understands the power of minimalism - there is very little to get in your way. It's a dungeon crawler in the vein of Diablo (and made by members of the original Diablo team), where the only real goal is to take your character of choice and make them the biggest, most awesome badass they could possibly be. It's fun, it's addictive, it fills the void in our hearts that we all have while waiting for Diablo III, and it is the sort of game that will cause you to look up at your clock and suddenly realize that you've been spending the last five hours clicking on monsters nonstop. What's not to love? Check back tomorrow for Greg Tito's summer picks! See all of our summer gaming lists here. John Funk hates the fact that StarCraft II and BlazBlue: Continuum Shift come out on the same day.